Eric Holder: Damn punk shot Ferguson officers. Near the scene of the shooting. Police said after a Thursday morning home raid that three individuals were being questioned in connection with the case, but none of the three has been formally taken into custody. 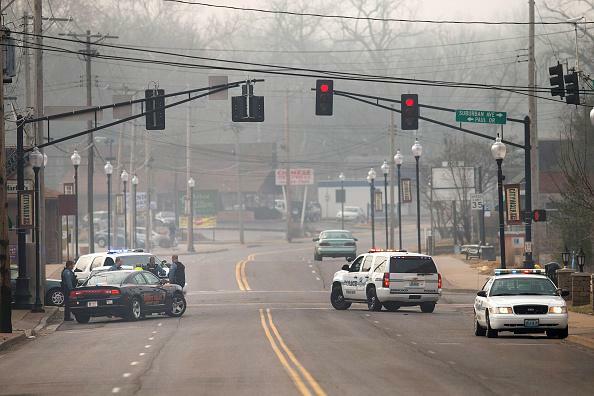 Both officers shot last night in #Ferguson have been released from hospital. One still has bullet lodged behind ear. Bell has since tweeted that no one was found in the attic; one of her colleagues says at least two individuals were taken out of the house earlier in handcuffs. Click here for our original post on the shooting.